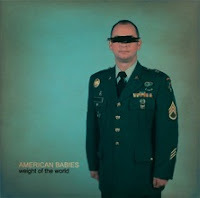 Head on over to AmericanBabies.net to see the new band website and read about Tom Hamilton's (American Babies, Brothers Past) and his Americana-rock based group American Babies new EP 'Weight of the World'. The CD release party will be in April at the World Cafe Live in Philadelphia, PA. The album art was a concept and design developed by Hamilton and after the success of our projects with Brothers Past, ABNRML was approached by Tom to help get it touched up, finalized and print ready. As with most things art, we enlisted the help of T-Bone and Aljax. The final product turned out great. Stay tuned for our work on American Babies LP 'Flawed Logic' release later this year. If you get a chance to see Hamilton with either Brothers Past or American Babies, do it. You will not regret it. 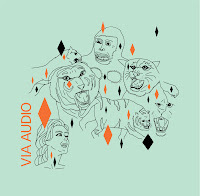 Download the single 'Weight of the World' off XPN's 'My Morning Download' right HERE. New VIA AUDIO 2010 T-shirts! Take a look at the new designs printing as I write this for indie band Via Audio. 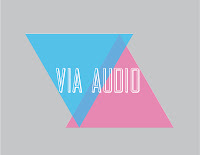 Via Audio has been a band ABNRML has listened to for years and we are thrilled to print these tour shirts for them. XMU has been playing their new single 'Babies' so watch these guys ascend the indie ladder! Their old tune 'Presets' has always been one of my favs. These two designs will be available at their upcoming shows and possiblyonline through their merch site!